Oh Harry how I have missed you! I didn’t realise until I was getting excited about every little bit of Philosopher’s Stone (if you follow me on twitter I am sure you will agree with me on this point!) how much I have missed Harry. Since the release of Deathly Hallows (the book not the film) my Harry Potter activity has dropped dramatically. I barely ever visit the Chamber of Secrets forums anymore, I don’t really use my Livejournal now except to read other people’s posts (and I didn’t talk about Harry on there much anyway, it was just very connected to the Harry Potter side of my life)., and unless you count my re-read of Deathly Hallows last year I haven’t read the books for years. 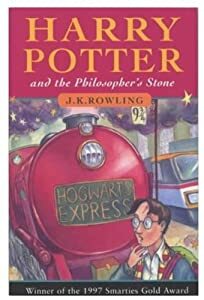 It’s a bit difficult for me to write a balanced review of Philosopher’s Stone simply because Harry Potter has been such a big part of my life for so long. I love it just because it’s part of Harry and part of my history. I am trying to remember how I viewed it when I first read it but it was so long ago that I can barely remember. I grew up with Harry so my first reading of Philosopher’s Stone was over 10 years ago. I do know for sure this is my least favourite of the books. First time round I actually almost gave up within the first few chapters just because it takes a long time to get going. Of course I am glad I didn’t because by the time Harry got to Hogwarts I was beginning to really get into it. In truth I usually actually don’t start my re-reads at the beginning but skip to Hagrid’s entrance at the shack in the sea. This time though I decided I should do it properly and actually found myself really enjoying reading those bits I usually miss. I mean the bits when the letters come give a kind of exciting anticipation for what I know is coming up. As I came further towards the end it struck me that although this is the lightest-hearted of the Harry Potter books in some parts it is pretty dark. I mean that image of Quirrel-mort drinking that unicorns blood is certainly very chilling, and when you are so engrossed in Harry’s world you can actually feel the revulsion Harry would feel from seeing that image. Then there is Quirrel having Voldemort sticking out the back of his head, that isn’t exactly a nice image either. Of course the way Harry wins in this book is amazing, and in some ways less scary, although you’re rooting for Harry there is something about the way he wins that seems so innocent and right, almost as if he is not really fighting. I remember eagerly looking for the next book after I finished this one and now I am eager to start my re-read of The Chamber of Secrets. Wow, it’s amazing how many people are re-reading the HP series now! I’ve re-read the first 3 in past few months & have the last 4 to read for the first time, hopefully soon. I should read Goblet of Fire this summer. I’m surprised that the first book is your least favourite but then again, it’s quite different from the later books, isn’t it? I found Prisoner of Azkaban quite dark than my first read-through of it. Anyway, I’ll be checking back as you re-read the series. I re-read them every couple years or so. It allows me to revisit my childhood. I’m not that much younger than you. I was a senior in high school when it came it. I read it and liked it, but I do not have an emotional attachment to books 5-7 as much as I do 1-4. I do, but mainly because by then I was a fanatic! I don’t really like the films, I’ve only re-watched Order of the Phoenix, and that was a mistake! I’ve re-read the books uncountable times though.